God not only tolerates inquiry, He welcomes it. Now in the sixth month the angel Gabriel was sent from God to a city in Galilee called Nazareth, to a virgin engaged to a man whose name was Joseph, of the [descendants of David; and the virgin’s name was Mary. And coming in, he said to her, Greetings, favored one! The Lord is with you.” But she was very perplexed at this statement, and kept pondering what kind of salutation this was. Mary goes about her normal routine on a seemingly normal day. Was she tending to her chores in her father's house? Was she fetching water? Maybe she was preparing or her rapidly approaching nuptuals. We do not know what she was doing. We only know that God's alarm clock rang out and it was time for him to make his move. Suddenly, an angel appears to her and delivers great news to her. At least, Gabriel interprets this news as great. It appears Mary doesn't take this news with a leap of joy. Scripture says she is perplexed. What do you mean, 'The Lord is with me?' The angel will even go so far as to beg her not to be afraid. God sends news of blessing, joy, honor, and glory that is not just gospel for Mary, but also for the entire universe. But to Mary's ears, it is a word of terror. This is so new, so strange, so impossible, Why would I be favored in God's eyes? This leads to the next statement: she ponders. She takes the words of the angel as sent from God and meditates on them. What could they mean, do they stand up to reason? Mary, if nothing else, internalizes her every experience with Christ, from the annunciation to the resurrection. She thinks and thinks and thinks. Then she gets more information and thinks about it some more. She asks poignant, relevant questions. She tries to rationalize the things of God. She longs to see the fulfillment with her human eyes. When she has all the information and has reached the end of her mental faculties, she makes a very important decision; she places herself in God's hands and submits to his will. She does not receive a revelation. She does not have a mental breakthrough or a Eureka! moment. She simply comes to the end of rationale and decides to trust the One with all the answers, even if he is not giving away the answer key just yet. Mary, during The Annunciation, is a study on reason. Clearly, she is caught by surprise and wants to understand what is happening. However, she is not armed with the hindsight that we are privileged to have. She illustrates the virtue of using your mind to try and comprehend heavenly things. God wants to reveal himself, we should want to understand him. Growing up, I assumed that God frowns on questions. I assumed, wrongly, that God is not open to honest inquiry. I equated questions with unbelief and skepticism with weakness. 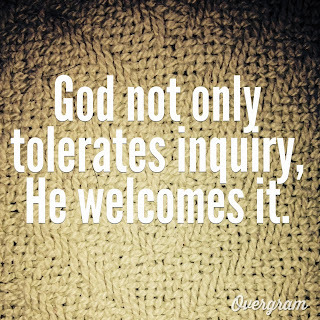 However, it is clear from this instance (and others) that God not only tolerates inquiry, he welcomes it. Obviously, God as an omniscient being knows the intents of the heart. He is able to tell if the question springs from unbelief or from honesty. He will always honor honest questions, though sometimes holds the answers just beyond reach. Sometimes that is just part of the learning process. Sometimes, the answer is just beyond what you can handle now and need to develop more. This happens in natural life, it also happens in spiritual life. Do not be discouraged when you find yourself confused and unsure of the answers. This is part of the growth process. Know that sometimes you just have to trust that the things you know still hold true and submit your future into the hands of the God who made the answer key.